For more information about our services, complete the form at the end of this page. In collaboration with the city, a needs assessment is conducted to find out what you want your GIS to do. We talk with all the people who will manage and operate SeeCity and those who have a need to use the information. From this fact finding, the necessary GIS tasks are decided along with a list of data requirements. Then NewCom finds all the available GIS data, such as county datasets and tax assessor data, on which to base your GIS. If no dataset exists, it can be created. 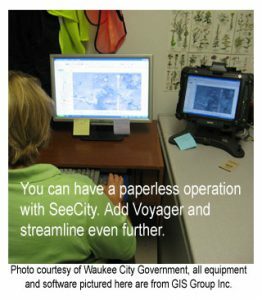 Next, an evaluation of the legacy data about your facilities and municipal assets — maps and CAD files, paper records, computer files — is performed. After analysis of the needs assessment and legacy data, you are given a quote for the basic system. As NewCom creates your SeeCity GIS database, check-ins are routinely conducted with the city officials to review benchmarks in the GIS development. And of course, there is 24/7 help available after delivery in addition to on-site training, software updates, and adding new features to the database. NewCom also offers a maintenance service to add newly engineered facilities and additional data. You won’t be disappointed with what NewCom can offer … SeeCity at the basic level will reduce the amount of time, trouble, and money you spend to manage your city and facilities. Converting your records to GIS format allows you to easily access, update, analyze, and share the comprehensive view of infrastructure that is stored in a central location. Since the GIS data is in digital format, it can be copied and archived to decrease the risk of information loss. Our customers have the ability to make changes to their information and then publish maps for field crews, citizens, and websites. Existing paper facility records are often inaccurate and in deteriorating condition. These records do not show changes or upgrades that have been performed. Often, a comprehensive view of the infrastructure can only be seen when looking at many different maps from different surveys, upgrades, and additions. In many situations, facility information is not documented and the facts are solely trusted to the staff’s memory. When staff leaves, or paper records are lost or destroyed, the organization is left with little information about their infrastructure. Converting infrastructure records from staff knowledge and paper documents into digital GIS data protects our customers from this loss of critical information and puts the control of the data in the city’s own hands. NewCom offers a complete line of GIS data development and conversion services. GIS feature classes and datasets can be constructed according to client specifications, or GIS Group can provide a comprehensive set of attributes that follow industry standards. All feature attributes can be customized to meet our client needs. GIS data can be provided in all ESRI formats; SDE, Personal Geodatabases, File Geodatabases and Shapefiles. In addition, we can export your GIS data to alternate CAD formats. All GIS datasets are constructed with FDGC compliant metadata provided as part of the project deliverables.